Happy Spooktacular September everyone!! I’m Cheryl, the voice behind TidyMom.net, a food, lifestyle and home blog, and I’m SOOO excited to be here today!! 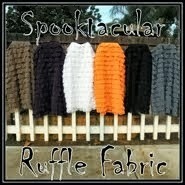 One of my favorite things about Halloween is all the fun treats! 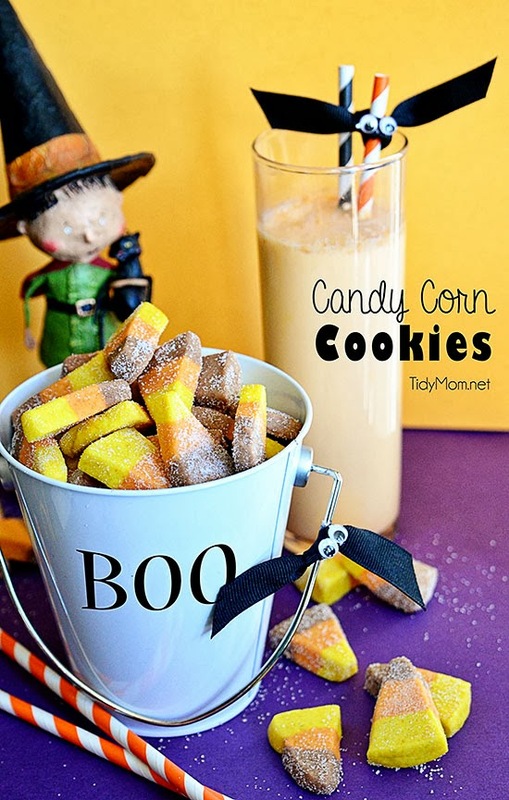 Today I’m sharing how to make Candy Corn Cookies using your favorite cookie recipe. 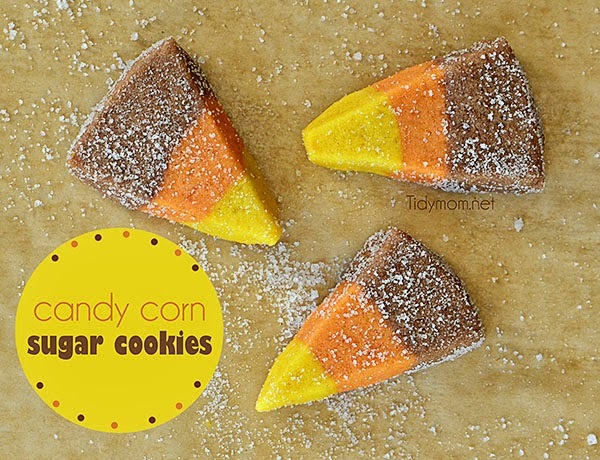 Next you need to color your dough to look like candy corn. Return 1/3 of your dough back to your mixer and add a little yellow gel color (I used Wilton Lemon Yellow), another 1/3 with orange (I used Wilton Orange) and the last 1/3 you can either leave plain for a traditional white, orange and yellow candy corn, or you can color with Wilton Brown Gel Color, OR you can melt 1 ounce of semi sweet chocolate and mix that into your dough for the brown, orange and yellow candy corn like I did! 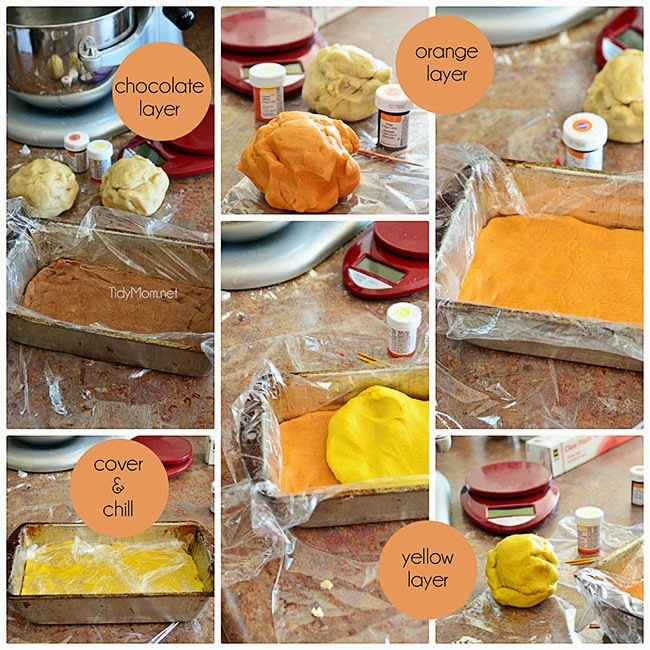 Once you have all of your dough colored, line a loaf pan with plastic wrap. Take the white or brown (which ever you are using) dough and press it evenly into the bottom of the loaf pan. Then press orange dough over the white/brown, and lastly, press the yellow over the orange. Fold plastic wrap over dough and chill in refrigerator for at least two hours. After dough has chilled for a few hours, remove from pan and plastic wrap. Cut dough brick into 1/4 inch slices, then cut each slice into 6-7 wedges. Place 1-inch apart onto parchment lined baking sheet. Bake 10-12 minutes or until bottoms are slightly browned. Cool for just 1 minute, then immediately place warm cookies in bowl of sugar to coat. Place cookies on cooling rack to cool completely. Enjoy!!! I love how quick and easy these cookie are and don’t they turn out just adorable?! 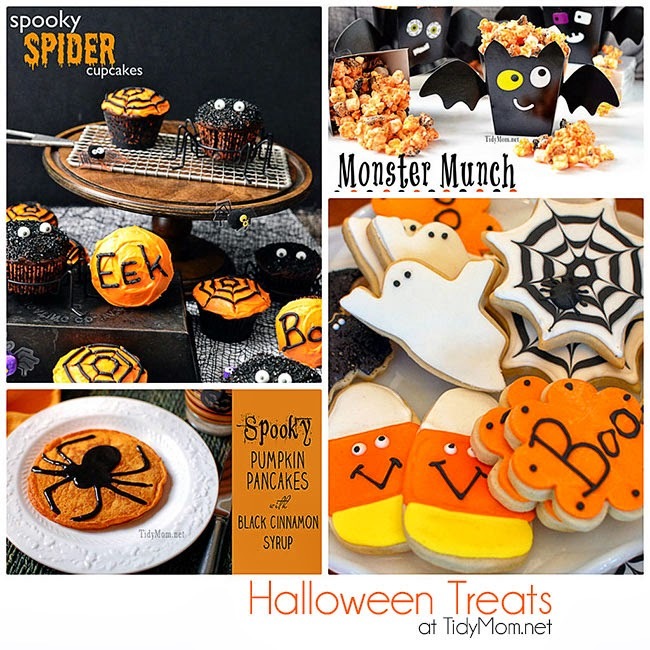 If you enjoyed this treat, hop on over to my blog for more Halloween ideas! love these so much! My kids would have fun making these! Can't wait to try the recipe myself! I pretty much love everything Cheryl does:) Great photos too! The chocolate layer is a tasty and cute alternative. 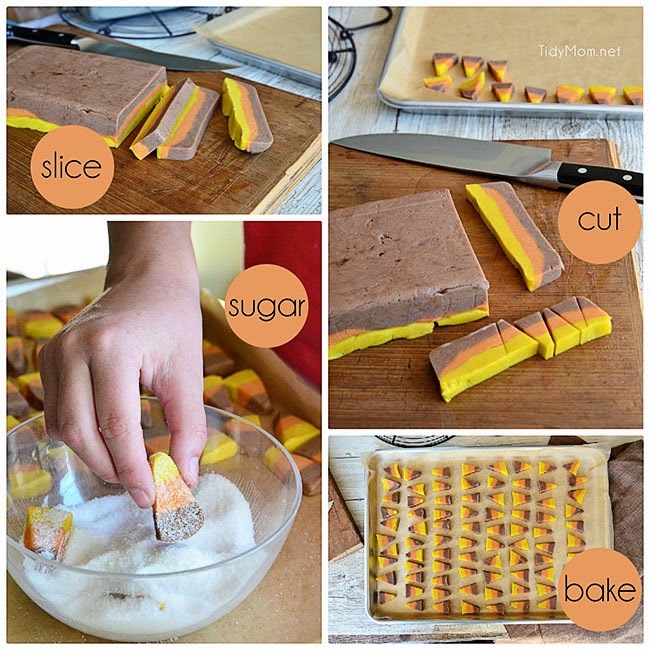 A fun way to change up Halloween sugar cookies. Such a cute and fun idea! These look like so much fun to make! And eat!!! how cute are these! so creative. Cuteness Galore! Love candy corn stuff!